This exquisite key chain is an ideal favor to present to your family and friends at Baptisms, Communions, and so many more occasions. 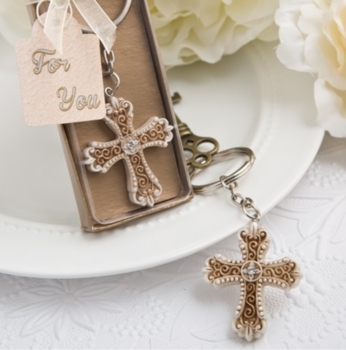 Your guests will be reminded of your blessed event each day as they see this beautiful vintage style cross with their keys. Crafted from poly resin, each filigree pattern cross is hand painted in an antique ivory and matte gold finish. A rhinestone adorns the center of the cross. Each cross measures 1 1/2 inches wide by 1 3/4 inches long. The total length with key chain is 4 inches. Each favor is packaged in a gold toned box with clear top. The box is tied with an ivory toned ribbon and adorned with a small tag that reads �For You� on it. Add custom labels or stickers for an additional fee by using our interactive "Click here to create your design" editor.